Today’s blog post was written by Dan Kolansky, Director of Marketing for Virtual Administrator. Being the genius that I am, I figured it just meant that when you want to grow your business you just need to seek out “mavens” and “connectors.” That was that, a whole book summed up in a sentence right there. And if you’re anything like I was, you can stop reading this blog post here and get on with your life. I personally never even broke the spine on my fresh copy of “The Tipping Point”…Until this year. This year was different for some reason. Perhaps it was boredom, or perhaps the book looked particularly lonely, but I decided it was time to dive in and really see what masterpiece Malcolm Gladwell had cooked up. And a masterpiece it is. As a business owner and full-time marketer, the message of “The Tipping Point” resounded very deeply with my entrepreneurial instinct. I was thrown off-balance quickly as he almost immediately began studying the spread of a disease as a comparison for the spread of messages, and then jumped right to Sesame Street and Blue’s Clues (my daughter’s all-time favorite show) just one chapter later to illustrate stickiness. You see, “The Tipping Point” was never a book for business owners or marketers. It was a study of…well…fads, really. “The Tipping Point” followed messages, ideas, and cultural phenomena as they spread throughout local and global communities. He was trying to put his finger on what makes things “tip.” At what point does something small become somthing big? In fact, in the edition I picked up this year to augment the one I had purchased originally, there is an additional section in which Malcolm Gladwell admits that he really had no specific purpose for writing the book other than academic insight- the book has evolved to take on a life of its own. So Why Read The Tipping Point? 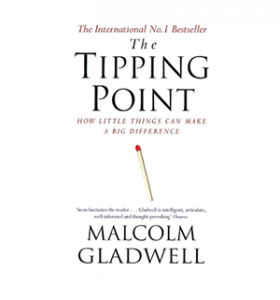 As a business owner, or as a marketer, what does “The Tipping Point” offer to us- especially after realizing it wasn’t written specifically to us? “The Tipping Point” gives insight into why some things go mainstream and others are stifled- doomed to live and die in obscurity. Knowing this, it is possible to create circumstances (or at least recognize when the stars are aligned) for your business to grow and “tip” into the mainstream and out of obscurity. And the number one lesson from the book, which actually isn’t explicitly stated until the very end, is to test, test, test. Test everything! Come up with metrics for everything, and see how things change as you change the message of your company. As the book states, if testing hadn’t been such a big part of the growth of Sesame Street, it is very likely that the show would have just been a footnote as a failed experiment. It was only because of methodical testing that show was able to succeed. The same goes for Blue’s Clues. And the same goes for your business. Finding Connectors and Mavens is important, but companies need two-way communication with their clients in order to correctly identify who the mavens and connectors are. Bottom line, this book is worth reading and it will likely highlight some key things you could change about your company today. So stop procrastinating (like I did) and dive into “The Tipping Point” today.